This article is about how to reduce 1) junk showing up in your USPS mailbox; 2) spam and unsolicited email you didn’t ask for and 3) telemarketing. 1. The major credit bureaus, otherwise known as credit reporting agencies (“CRAs”), sell information about you to companies that want to mail you junk you don’t need and don’t want. Did you ask to have your time wasted and home and mailbox cluttered up with useless debris? Fortunately, the federal government has required the CRAs to provide a website where you can go and “opt out” of receiving some of this trash. Go to: www.optoutprescreen.com and follow the simple instructions. It only takes a few minutes and you will be taken off some of these mailing lists for at least 5 years. After opting out you should begin to notice less junk showing up in your mailbox. The site also gives you the option to opt out permanently. 2. Now go to www.dmachoice.org to reduce even more the useless crap and trash that shows up in your mailbox. This site is setup by a trade organization called the “Direct Marketing Association” and they kindly give you a “Mail Preference Service”. By following the simple instructions on this site you can be removed from many more mailing lists. Here you can opt out of receiving unsolicited commercial junk-mail from many national companies for five years. Similar rules apply to faxes. The fax must provide a return number at which you can opt out of receiving any future faxes from that particular sender. Many state and federal laws allow you to sue the senders of junk faxes and junk email if you have previously asked the sender not to contact you and they do so again. 4. TeleMarketers. If you have not already done so, Go to www.donotcall.gov and register all your phone numbers. That said, unfortunately most professional telemarketers could not care less about the Do Not Call Registry. They do not comply with it. They have no respect for the rule of law. They have no respect for you, your privacy or your desire to not be harassed by them. If you have been harassed by telemarketers you already know I am preaching to the choir. The best way to reduce telemarketing calls from robo-callers is to start suing them. For more on that subject, go to: I SUE TELEMARKETERS The main reason I recommend listing all your phone numbers on the Do-Not-Call Registry, is that doing so increases the legal liability of the morons who choose to harass you with their auto-dialers anyway. If I am hired to sue them, I can make them pay more money for calling numbers listed on the Registry than I can for numbers that were not listed on the Registry. The Registry was established by direction of the United States Congress and there can be consequences for ignoring it. I believe there is “a real do-not-call list” that is passed around inside the telemarketing industry. While the industry generally just ignores www.donotcall.gov, there is a real do-not-call list the smarter telemarketers take seriously: the list of people who sue telemarketers. Believe it or not, there are filthy people of very low moral character out there who as an occupation research and compile lists of people who have actually sued telemarketers. Then they sell their services to telemarketers, proclaiming that they can help telemarketers continue to illegally robo-call and harass millions of people on a regular basis while reducing the risk of being sued. I think of these types of people as co-conspirators in criminal enterprises. So again, the best way to reduce the number of telemarketing calls you receive is to start suing telemarketers. Being made to pay money for auto-dialing phone numbers listed on the Do-Not-Call Registry is what sinks into their thick little brains. Ready to get started? 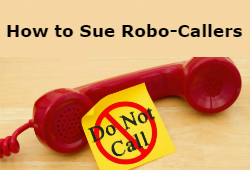 Learn How to Sue Robo-Callers. This entry was posted in Common Problems, Consumer and tagged Illegal Robocalls, Junk Mail, SPAM, Telemarketers by Sid Childress. Bookmark the permalink.